A highlight of successful series "The Mentalist" is watching the developing relationship between by-the-book CBI Agent Teresa Lisbon (Robin Tunney) and irreverent, eccentric consultant Patrick Jane. With a constant exchange of heated banter, wry looks, and friendly competition, Lisbon and Jane gradually show us their mutual respect and affection for one another. Lisbon's professionalism and Jane's tortured past prevent this from developing into a true romance, but if you watch carefully, these five episodes of "The Mentalist" give us tantalizing moments of both sweetness and flirtation between our two heroes. Season 1, Episode 6: "Red-handed"
While investigating the death of a casino owner on "The Mentalist," Jane manages to rake in a fortune by counting cards at blackjack. His newfound wealth and generosity leads to a fun scene at a bar, with the casually dressed agents sporting a quarter million dollars worth of jewelry. The practical Lisbon has an attack of conscience over the extravagance, but Jane smoothly protests: "I know those emeralds look lovely with your eyes." Lisbon blushes like a schoolgirl but relinquishes the necklace, gently laying a hand across Jane's back in thanks before she takes off. Season 1, Episode 11: "Red John's Friends"
When a convict with a link to Red John is discovered dead at the serial killer's hands, Jane is devastated by both the loss of life and the loss of a lead to his wife and child's killer. As he sits on a hotel room bed near the crime scene, staring vacantly, Lisbon visibly struggles with how to comfort him. With the look in her eyes and just the slightest brush of her hand against his arm, we sense the tenderness she feels for the emotionally walled-off Jane. Season 1, Episode 16: "Blindness"
Lisbon and Jane barely escape a car bomb with their lives, and the explosion blinds Jane temporarily. Fearing the disability might be permanent, Jane lashes out at everyone and insists on working despite orders to rest. It becomes evident how close Lisbon and Jane are becoming, as Lisbon is able to maneuver through the minefield of Jane's personal boundaries to take care of him. We get rewarded with a pure moment of Lisbon and Jane affection on "The Mentalist," with a sweetly sensual scene where the blinded Jane reaches out to gently trace the smile on Lisbon's face. Season 2, Episode 1: "Redemption"
Jane takes his bluntness about the futility of police work too far this time, and Lisbon's angry enough to take off in the SUV and leave him behind at a crime scene. Jane later apologizes with a conciliatory gift of fresh strawberries, and a desperate plea to work: "I have nothing else to do." Moved by the intensity of his declaration, Lisbon concedes. "The Mentalist" viewers, and Lisbon, get a pleasant surprise as Jane warmly embraces her with heartfelt thanks. Season 2, Episode 11: "Rose-colored Glasses"
While investigating a case at a high school reunion, Jane tries to guess what sort of girl Lisbon was -- and what instrument she played. Lisbon is amused that Jane keeps getting it totally wrong. 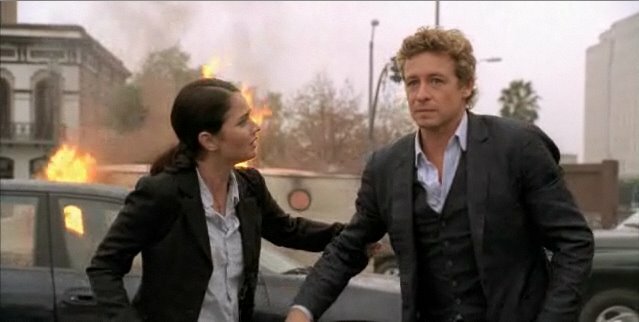 At the end of the reunion, Jane asks Lisbon to dance, and urges her to pretend he was the boy she crushed on back in high school. Lisbon won't give in to his baiting, but she agrees to the dance. It's the sweetest and most romantic moment between the pair yet on "The Mentalist," as the two hold each other close and sway to the music. "Trombone?" Jane asks, his final guess. "Nope," Lisbon replies, and then she closes her eyes and nestles into the crook of his neck. The Event Pilot : "I Haven't Told You Everything"